I am adding a new feature to my blog, starting with the the previous post. From now on, I will be including a cost analysis for each of the recipes I make. Why, you may ask? The last year has brought many changes to the neon celery kitchen. Among those changes has been a move from being a two-income household to just the one. While our change has been (mostly) by choice, I think a lot of people are finding themselves in similar situations these days. So, I thought I would share my calculations with you. For me, calculating the cost of each recipe is a way to keep track of where my grocery money is going, and gives me confirmation that cooking at home is not only healthier for our bodies, but also for our wallets. 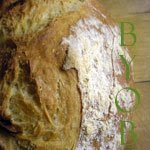 Along the same lines, I have joined up with BYOB--that's "Bake Your Own Bread." They are a group of bloggers who have taken the pledge to bake all of their own breads, rather than buying them at the grocery store. They are an inspiration to me, and I am looking forward to the challenge. I hope you enjoy the new features. Happy cooking/baking! Good idea on the cost analysis. Maybe I should try adding cost next to my recipes too.